Back from a few days at a wedding in Tuscany we had another one-night layover in the “eternal city” and of course I was again on a foodie mission. The few blogs I looked over before our trip all mentioned Roscioli’s bakery as an institution, albeit controversially discussed. Somewhere, I don’t exactly remember where, I read that especially the dough at Roscioli was outstanding and so I decided to go for it. 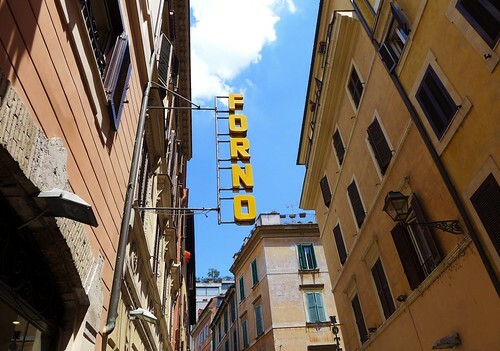 The Forno is located in one of the narrow streets of Centro Storico and besides pizze, offers plenty of other baked goods. I opted for a slice of the plain pizza rossa whereas my brother chose one topped with buffalo mozzarella, tomatoes and basil, a so called Caprese. 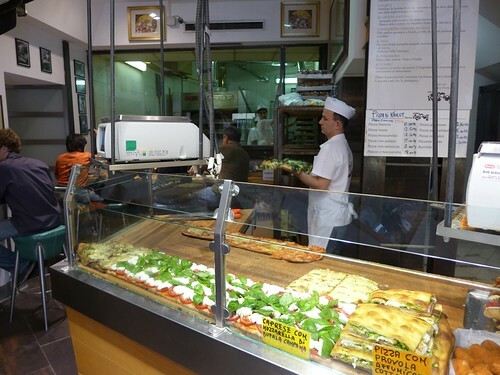 The baker cuts off slices with a giant knife and weighs the pizza for pricing. 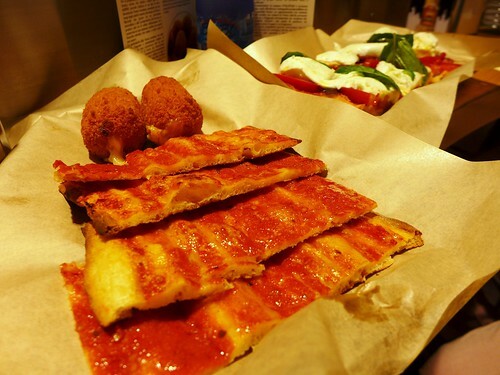 The particularity with the Roscioli pizza certainly is the dough – It probably is very much different from 99.9% of all served pizze. It is a slightly sour dough, a little tougher than some might prefer, but definitely crisp and tasty. 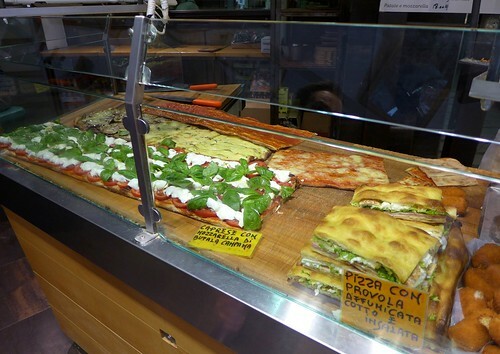 As if someone would back just the crust of a dark baguette to use it as a pizza surface! I suppose they use their own natural yeast instead of standardized commercial yeast for getting this special flavor touch. And clearly, having only some tomato sauce on top of my slice helped catching the great flavor of the crust. As a final word: I wouldn’t say that this is a must go when in Rome, but definitely a noteworthy artisanal shop. 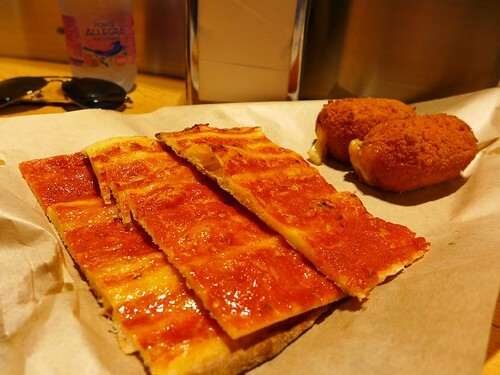 When walking by, just grab a slice of pizza rossa on the go.